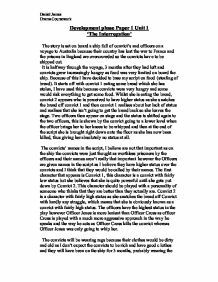 Development phase Paper 1 Unit 1 'The Interrogation' The story is set on board a ship full of convict's and officers on a voyage to Australia because their country has lost the war to France and the prisons in England are overcrowded so the convicts have to be shipped out. It is halfway through the voyage, 3 months after they had left and convicts grew increasingly hungry as food was very limited on board the ship. Because of this I have decided to base my script on food (stealing of bread). It starts off with convict 1 eating some bread which she has stolen, I have used this because convicts were very hungry and some would risk everything to get some food. Whilst she is eating the bread, convict 2 appears who is perceived to have higher status as she snatches the bread off convict 1 and then convict 1 realises about her lack of status and realises that she isn't going to get the bread back so she leaves the stage. Two officers then appear on stage and the status is shifted again to the two officers, this is shown by the convict going to ...read more. The officers have the highest status in the play however Officer Jones is more lenient than Officer Cross as officer Cross is played with a much more aggressive approach in the way he speaks and the way he acts as Officer Cross kills the convict whereas Officer Jones was only going to whip her. The convicts will be wearing rags because their clothes would be dirty and old as I don't expect the convicts to be rich and have good clothes and they will have been on the ship for 3 months, probably wearing the same clothes everyday. The Officers however will be wearing a uniform to give the characters a sense of control and order over the convicts because the officers have the higher status. The only props that will be used are the whips, the knife and the bread. The bread is eaten by the convicts, not only that but it plays an important part in the script as the bread has been stolen from the officers table and this results in the death of a convict. The knife also plays a key role in the script as it is used to kill the convict. ...read more. an outline of a boat or a drawing of the ocean around the sides and the back of the stage. Throughout the play I will keep to having low level lighting because this give the effect that the hulks on the ship was a dark and gloomy place also because of the fact that there is no scene change in the script. If I was to add any extra lighting, I might introduce a spotlight in the centre of the stage for most of the action to happen there, thus giving the effectiveness of the small narrow space on the ship. The message that I am trying to communicate to the audience is the change in status between different classes of people. In my script there is an upward change in status because it starts off with a convict with barely any status and finishes with an officer of the highest status killing one of the convicts. This can also be reflected in real life so people may think about their own society after watching it for example we, the public have barely any status and it leads up to the queen having the highest status. ?? ?? ?? ?? 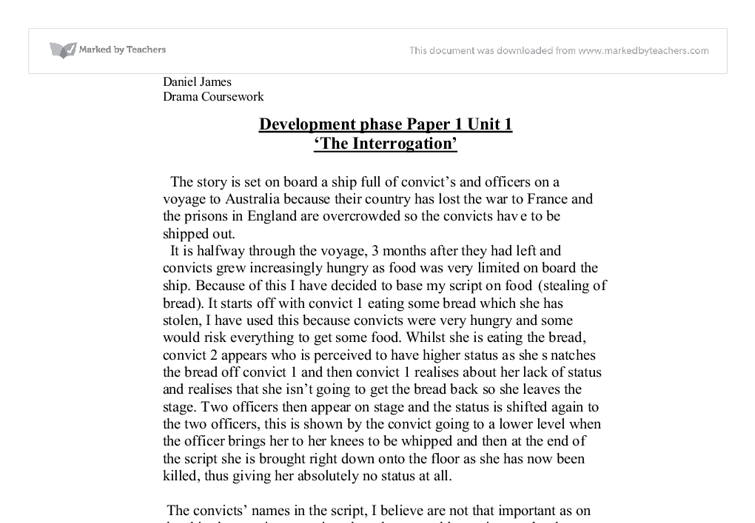 Daniel James Drama Coursework ...read more. The Head C.E.O. however is deeply engrossed in this interview and Mustafa really interests him as he explains how he immigrated at the age of four and went on to get nine G.C.S.E.s, three A-Levels and a degree in Physics and Psychology. This would have appealed to the medieval audience who were 'closer in time and temperament to the old religions and would [have been] superstitious'.3 However, as society turned to Christianity, Robin too became a devout Christian. The audiences' dissatisfaction with high taxes and corrupt church officials was reflected in Robin Hood's actions. Miss Precious: Officer, I was just about to go out and pay my rent, but then when I looked in my bag, I couldn't find the money, the money was gone, so I called all them here, and I asked them if they have taken the money, but they all said they haven't taken it. What should you do to give a good speech. Suggested answers: - write out the speech and memorise the script; - practice, practice, practice! - choose an interesting title; - make it short, funny and captivating; - speak clearly with a moderate speed; - use simple language and make sure one idea is connected to another naturally. choose a boy from the group to play the part of a female, so I was chosen and so instead of putting me to act as a female, we converted Ms. Casewell to Mr. Casewell. There were some speeches that talked specifically about Ms.
me as I recall it. The scene (Act) begins by the slaves being marched by the slave masters across Egypt and we showed this by having Chris, Dean, Glenn etc walking across the front of the stage and up the side stairs on to the stage itself, we did this to symbolise being marched across Africa onto the slave ship.